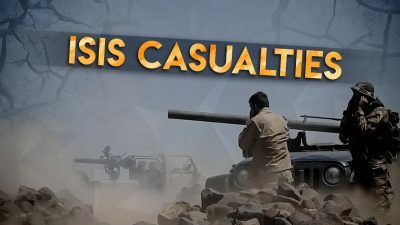 About 100 ISIS members have been killed in the area of al-Safa in the southern Syrian desert since pro-government forces started the active phase of their military operation there. According to pro-government sources, this number is likely to grow further because clashes are still ongoing in the area. The Syrian Arab Army (SAA) repelled an attack by Idlib militants on a post located south of the village of Tal al-Touqan in the southern part of Idlib province. SAA artillery units also engaged militant positions west of Tal al-Touqan. Two hundred Military Police servicemen have returned from Syria to their base in Russia’s Southern Military District. Earlier, according to official reports, 35 planes and helicopters, flight officers, a medical unit of special purpose and military police officers had already returned to their home bases in Russia. According to satellite imagery available online, the Russian Aerospace Forces are keeping in Syria at least 9 Su-24M2, 6 Su-34 and Su-35 warplanes as well as an unknown number of attack and military transport helicopters, UAVs and support planes. Washington is trying to slow down the return of refugees to Syria by refusing to participate in the restoration of the country’s infrastructure, Russian Foreign Minister Sergey Lavrov said on August 20 as he met with Lebanese Foreign Minister Gebran Bassil. At the same time, Bassil said that his country supports Russia’s initiative on Syrian refugees and hopes that it will be employed. On August 15, Russian Foreign Ministry representative Nikolai Burtsev said that about 11m Syrians are currently considered forcibly displaced persons, 6m of those have become refugees within the country. In Iraq, late on August 19th, a US serviceman was killed and several others injured when their helicopter crashed after participating in a raid on an ISIS target. The Pentagon said that there is no evidence indicating that the helicopter may have been downed by enemy fire. The US military did not provide further details into the incident. However, according to media reports, the helicopter involved was a MH-60 Black Hawk operated by the 160th Special Operations Aviation Regiment.